i Still write: A Call to Hearts Pt2. Ready to see the results?? 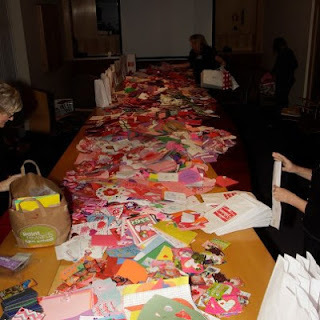 Over 13000 cards were collected. To say the results were more than the station expected is an understatement. Here is the video of the visit. You can click in the corner of the video to make full screen. The second video on the player is the "stuffing" party for the cards into bags. This is a REALLY bad photo.. The video is better. Again THANK YOU ALL for your help.